Condo with 2 bedrooms, each with its's own bathroom/shower and queen sized beds. Bienvenido a Melaque! 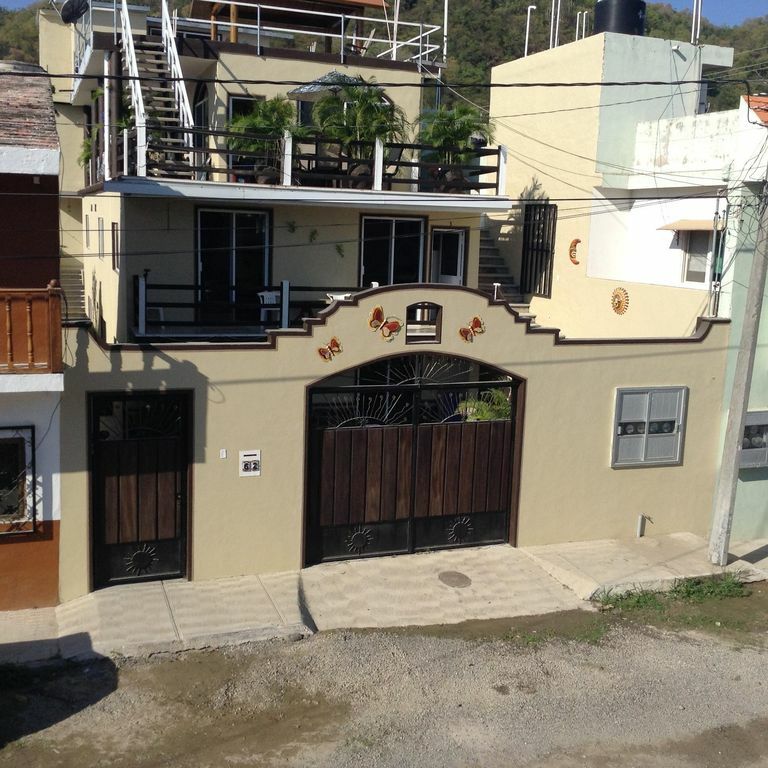 This is a secure condo complex less than 90 meters from a quiet beach. Features 2 bedrooms with queen sized beds and a private bathroom in each bedroom.. Cable, flatscreen TV, as well as wireless internet. Fully modern kitchen and large living room/dining room. Relax on the shaded rooftop terrace while enjoying the great ocean view and the gentle sea breeze. You'll be able to swim in a quiet bay less than 90 meters from the front door. There are several great restaurants nearby as well. Whale watching and deep sea fishing excursions can be arranged through the owner. We can meet you at the Manzanillo airport when you arrive, give you a short tour on the way to the condo and also stop for whatever supplies you may need for your stay. My name is Ana Rodriguez. I own and operate the business. I'm one of the few "locals" who have spent the majority of my life in the area working in the hospitality business. Guests travelling to Melaque have their choices of more than a dozen different locations to explore during their stay, most of which are different beaches with small communities. Because this is a 6 unit complex, most guests return year after year and are able to help newcomers 'learn the ropes.' Our central location is perfect for travellers who don't have a car - you can walk one minute to the beach or five minutes to the heart of the sleepy little town. If you prefer, we have a Ford Escape available for rent, weekly or monthly. There are grocery stores nearby, as well as a bunch of seaside pubs/restaurants. Beer is less than a buck a bottle, right on the beach! And a great fresh seafood plate will run you $7 or $8. We offer day tours to many super locations! The complex is located less than 100 yards from a great beach! We have a great 360 degree view of the mountains, village and ocean! Great rooftop 360 degree view of the mountains, ocean and village! Tastefully decorated with modern furnishings and updated as required. Bar area is suitable for 4 adults to eat comfortably. Some units have Shaw Direct Sattelite. For person's wanting to be assured they will have Shaw, please bring your own receivers. We have men's and lady's bike available to rent. Local boat charters can be arranged with experienced captains. Golf tours can be arranged at Isla De Navidad, one of the top golf destinations in the world. Owner can arrange for deap sea fishing charters for marlin, sailfish and dorado. Also whale watching and tours to local beaches. Ford Escape available to rent weekly or monthly. Thanks for your comments! Looking forward to seeing you and your family on your next visit. Saludos! Great vacation, clean and modern! Very nice, safe and clean! Close to the beach and all amenities. The house is in the quiet part of the area which suited us well. Just 10 minutes to town and 2 to the beach. Excellent restaurants along the beach for affordable, delicious snacks or meals -- everything is so fresh. The apartment was large enough and equipped with basic amenities. Wi-fi was intermittent at times but the booster helped. Lots of room for your things with counters, shelves and tables. No screen on the door in apt #4 so we did contend with a few mosquitoes at night as we liked the door open in the evening to catch a bit of the breeze to help cool down the place. Nice neighbours, little convenience stores in the neighbourhood, a great place to walk around even late in the evening. As two women travelers, we felt safe the whole time. Les was quick to respond to e-mails and all the questions I had ahead of time which helped ease our concerns and prepare for the relaxing holiday it was. We both were thrilled when Ana drove us over to our condo . We were on the main floor with two beautiful windows looking out at a very very well kept courtyard. The bedrooms were very large and both had their own bathrooms... Very nice if company arrives... The kitchen was very well equipped and the living room had a beautiful couch, loveseat and chair. The complex is very secure and in a quiet location within walking distance of the main square and shopping. I also found a great place within two streets that offered pilates and i even found a yoga studio past the main square... We both fell in love the Ocieta and Krystal they are the welcome dogs and are the nicest most well behaved dogs. Miss them!!! Les and Ana are fabulous they are there is you need anything and are most pleasant company at happy hour. Thanks again for a great vacation. We will definitely be booking with you for our next Mexican holiday. Melaque is a quiet town when compared to the resort cities of Puerto Vallarta & Manzanillo. The apartment was spacious, well-equipped & comfortable with friendly canines to greet you upon your arrival. There are several good restaurants and bars within easy walking distance. Several small convenience stores are also close by. A ten minute walk downtown gets to more amenities and shops. Bus service to the surrounding communities is frequent and there is good inter-city service. Ana & Les are good hosts and available for rides to the airport and tours of the area. We enjoyed our vacation and hope to return to relax in the evening on the roof top patio. Couldn't ask for a better place to stay in Melaque! This was mine and my boyfriend's first time visiting Melaque. Les and Ana were very welcoming, picked us up from the bus depot, and took us for a great little tour of Melaque on the way back to the condos. The place is beautiful, very modern and clean. The rooftop patio is absolutely fabulous, great views and very relaxing. The beach is just a few metres down the road and the part of the beach the unit is close to is very nice. It's just a short walk into town, there are great restaurants and bars near by, the best tacos are right across the street, and there is a little mountain walk/hike just a few minutes walk away with stunning views. There are also many other close little towns that are a cheap taxi ride or fairly quick cycle away. We would definitely stay there again! Great snorkeling is a 5 minute hike from condo! World class golf 30 minutes away. Opportunities to deep sea fish abound - marlin, sailfish and dorado are numerous.